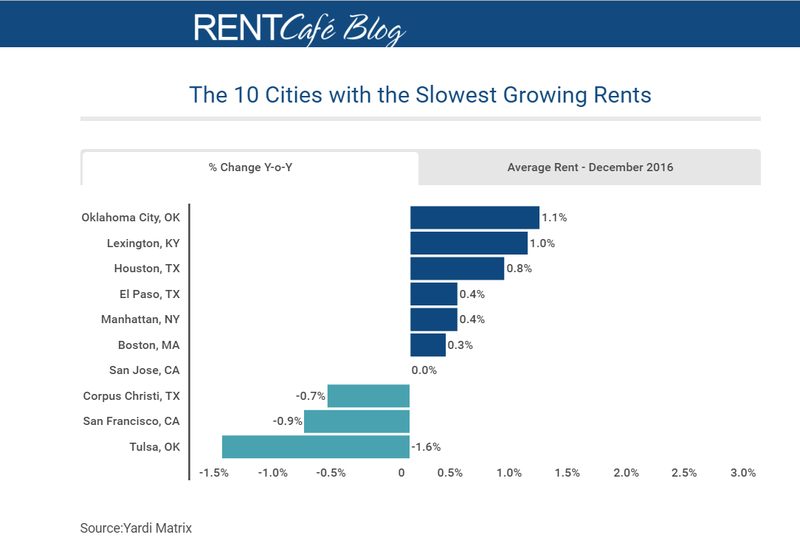 Things are slow in our local rental housing market. The chart below came to us from RENTCafe.com at http://www.rentcafe.com/apartments-for-rent/us/tx/el-paso/. Don’t look for growth in the rental tax base to save us. Looks like “It’s all good” did not take hold. This entry was posted on Saturday, January 21st, 2017 at 5:00 AM and is filed under Uncategorized. You can follow any responses to this entry through the RSS 2.0 feed. You can leave a response, or trackback from your own site. IF . . . I had to rent . . . I’d just “Make an Offer” of what I could pay/ would pay/ and they can either. . . take it . . . or pay the property taxes themselves ! Or put up more banners and try and give stuff away. Percent of occupancy is a much better measure of the health of the rental market. You known the market is soft when you start to see signs offering a free month or two. And it can be very localized, too. Meanwhile, there are still a number of apartment complexes under construction around and about town, as this is written. Why is that, one wonders? I agree that it is very hard to see how today’s young people can hope to buy a home, even in depressed El Paso, since our average income stays so low. Oh, but what am I saying? Y’all’s new President is gonna fix everything. You mean like how your president fixed healthcare, the economy and united this country? we are worse off than ever and the real problems started 8 years ago. You conveniently forget that the economy crashed in the fall of 2008 while GWB was in office, and that the financial markets are now at historic highs. But go on blaming everything on the Democrats if it makes you feel better. The liberals don’t seem to have a corner on righteous indignation. Unemployment? The real unemployment not the exaggerated demo unemployment numbers and the fact that myself and everyone I know have insurance premiums that have gone up almost $1,000 a month in 4 years and have had to change doctors and plans at least twice. All things that Obamanation PROMISED wouldn’t happen. People didn’t vote for Trump as much as they voted against the Obama/Crooked Hillary policies. It was a vote for a non politician. But it’s pointless to argue. The dems can do no wrong and the reps can do no right. Don’t forget, it’s democrats that run this crooked town. Coincidence? I think not. The ONLY thing that keeps ANYTHING from being rented. . . . is PRICE. Price, price. . . or price. If the landlords believe all this crap about about El Paso’s economy being great enough for downtown projects, having similar incomes as this and that “other” city . . . and homes and apartments don’t rent at inflated prices. It’s always been a fight . . . Renting versus Buying. When one gets jacked up . . . then the people will usually pay for whichever is cheaper. I don’t see HOW many of the new millennials will EVER be able to buy a house. Incomes have to get AHEAD of the home buying market. Small increases in Property Taxes make the payments go WAY up. SO much so . . . that many cannot qualify . . . ONLY because of the high Property Taxes. Everyone knows. . . that there is just NOT a hundred thousand dollars worth of sticks and sheet rock in the average home in EL Paso. Well, I guess we need to have a serious talk with Mike.